Ismail, M.; Pozo, F.; Rodellar, J. The problem of combining active damping with a purely passive isolation system, with hysteretic damping,to reduce possible pounding effects under near-fault ground motions is addressed. The used isolation system is a recentlyproposed one that is referred to as roll in cage (RNC) isolator. It has an integrated buffer mechanism to prevent excessive bearing displacements under strong seismic excitations. Therefore, possible pounding under such strong earthquakes will be within the bounds of RNC isolator to avoid adjacent structural pounding. Active control is invoked at a certain bearing displacement to reduce it before reaching its design limit, after which pounding takes place. It was found that increasing the RNC isolator’s inherent hysteretic damping reduces the bearing displacement and consequently alleviates or even eliminate pounding. Moreover, the integration of active control, at smaller bearing displacements, with the RNC isolator can reduce the bearing displacement but adds more rigidity to the isolation system, which leads to less efficient isolation. The problem of combining active damping with a purely passive isolation system, with hysteretic damping,to reduce possible pounding effects under near-fault ground motions is addressed. The used isolation system is a recentlyproposed one that is referred to as roll in cage (RNC) isolator. It has an integrated buffer mechanism to prevent excessive bearing displacements under strong seismic excitations. Therefore, possible pounding under such strong earthquakes will be within the bounds of RNC isolator to avoid adjacent structural pounding. Active control is invoked at a certain bearing displacement to reduce it before reaching its design limit, after which pounding takes place. It was found that increasing the RNC isolator’s inherent hysteretic damping reduces the bearing displacement and consequently alleviates or even eliminate pounding. Moreover, the integration of active control, at smaller bearing displacements, with the RNC isolator can reduce the bearing displacement but adds more rigidity to the isolation system, which leads to less efficient isolation. Abdel Kareem, M. I.; Pozo, F.; Rodellar, J. 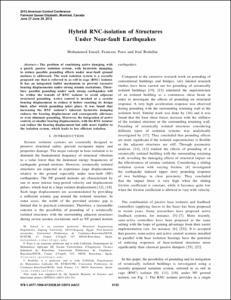 Hybrid RNC-isolation of structures under near-fault earthquakes. A: American Control Conference. "American Control Conference (ACC), 2012: 27-29 June 2012, Montreal, QC, Canada". Montréal: 2012, p. 6132-6139.